The Amazing Spider-Man was released on June 26, 2012 for the Nintendo Wii, and was based around the Spider-Man movie of the same name. The game was developed by Beenox and published by Activision, and it received an ESRB rating of "TEEN" with "Mild Language, Mild Suggestive Themes, Violence" listed as content for parents and gamers to be aware of. A description for the game on the Wii's Nintendo Channel says, "Spidey is back with the return of wall crawling, web-slinging action! Perform acrobatic attacks and stealth maneuvers with the brand new web rush combat system. Uncover the rest of Peter Parker's untold story in the original epilogue to the film." While we have looked at another Spider-Man Wii game before, how many hours have U.S. Wii owners reported web-slinging in The Amazing Spider-Man since it released last year? Brew yourself some coffee, and let's take a look! The Amazing Spider-Man has approximately 11,023 U.S. Wii owners that have reported gameplay hours, with 251 days possibly reported. The average play-time reported is 8 Hours 0 Minutes "Per person" as the image shows, which averages to be about 2 Hours 15 Minutes played per time (or day) reported. 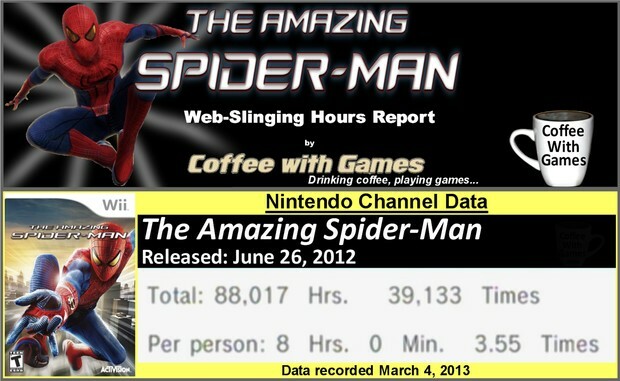 As the image also shows, U.S. Wii owners have reported web-slinging in The Amazing Spider-Man nearly 90,000 Total Hours (over 500 weeks' worth). While it's not as high as other games based on the number of days possibly reported, the fact the game did have hours show up in less than a year since it released is a positive compared to many other Wii games. What about critic and customer reviews for the Wii version of The Amazing Spider-Man? Well, the game has a "professional" critic review score average of 64.33%, based on 3 reviews on GameRankings.com. It has a customer review score average of 66.66%, based on 9 reviews from Amazon.com. While the Wii version of The Amazing Spider-Man bears the same name as the PlayStation 3 and Xbox 360 version released at the same time, it doesn't feature the exact same open-world gameplay of the other version, which I expect the open-world gameplay would add more hours and replay value to the game overall. This also might be one reason the customer and critic reviews of the Wii version of the game averaged lower than the other version, due to the limited exploration in the Wii version. 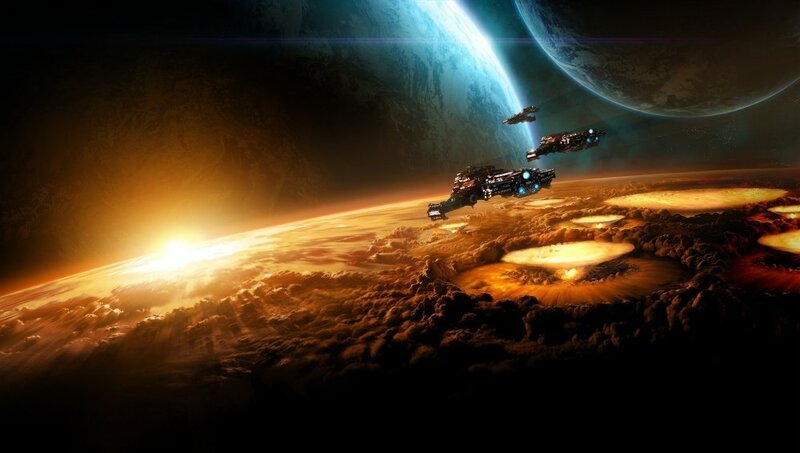 With the game's overall reported average of 8 Hours "Per person" probably being about how many hours you can expect to play it, before beating it, these reported hours are probably not a reflection time you can expect from the PC, PlayStation 3, Xbox 360, and now Wii U version(s) of the game. You can watch a movie many times, just as you can play a game many times. I always find it interesting to see what the average hours (and/or minutes) played per day/time is on games, and not just the overall reported average. Why? Because it shows if gamers are playing the game in shorter sessions, or longer sessions, and what I can maybe expect if I get it. I think it's interesting that Wii owners have reported playing The Amazing Spider-Man game (each time/day reported) about as long as it would take to watch the movie (a movie I still haven't seen!). The Amazing Spider-Man, the movie, has a run time of 136 minutes (which is 2 hours 16 minutes), and again, the Wii game's average play session is just over 2 hours 15 minutes. If you own a Wii U and are a Spider-Man fan, The Amazing Spider-Man Ultimate Edition which is based off the Xbox 360 and PlayStation 3 version(s) released today with a MSRP of just $39.99. The Wii U version includes four DLC packs, as well as some Wii U GamePad features (not in the other versions), including Off-screen Mode (Off-TV Play) which allows you to play the entire game on just the GamePad, if you like that option (I do). 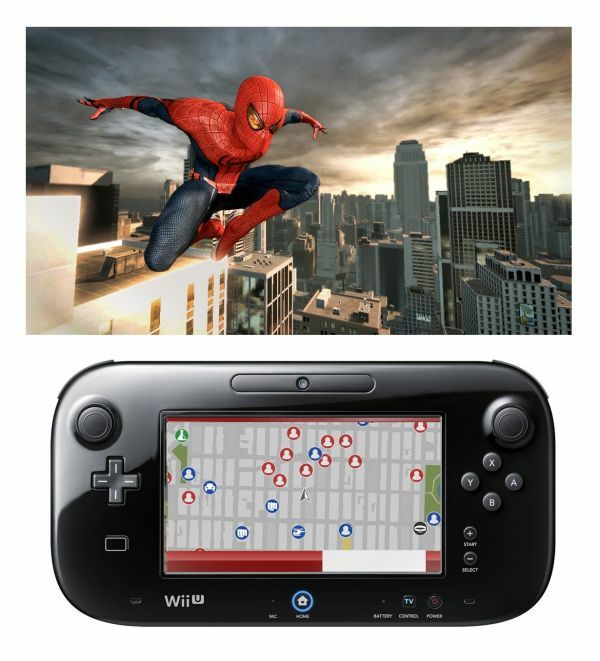 Have any of you played The Amazing Spider-Man on the Wii, or maybe another console? If you played the Wii version (or other console version), do you remember how many hours it took you to beat the game from start to finish? With the Wii U version, The Amazing Spider-Man Ultimate Edition, just releasing, are any of you planning on purchasing it and giving it a try?